If kids entertainment in the 90's taught us anything, it's that recycling is an essential aspect of environmentalism. So I suppose we should be applauding Blue Sky Studios in their success at recycling so impressively many of that era's tropes in Rio 2. If only this this 3D computer animated sequel weren't so bland and irritating, I'd almost feel bad in telling them that Ernest Goes to Camp beat them to the down-with-the-bulldozers!/save-the-trees ending by a mere twenty-seven years. Unlike 2011's Rio, an accomplished if forgettable adventure comedy with effective across-the-board appeal (which I genuinely enjoyed), Rio 2 cannot be considered as anything beyond a children's film, and the worst kind at that. Not only does Rio 2 boast a worn out environmentalist message, it's also overloaded with colorful, noisy, ever-quipping extrovert characters, each one voiced by a celebrity (among them Jamie Foxx, Tracy Morgan, Bruno Mars, George Lopez, Kristin Chenoweth and Jemaine Clement), who's ego must be appeased and paycheck must be justified by at least one supposed "laugh moment". Besides our returning lead characters of Blu (Jesse Eisenberg) and Jewel (Anne Hathaway) - a pair of ultra rare blue macaws thought to be the last survivors of their kind, and now languishing in a lousy, lopsided marriage with three chatty children (each brandishing one character trait apiece), there's every other vaguely remembered talking bird and other animal carried over from the first film. But Rio 2 sticks its annoying beak out even further, introducing a parade of yet more wacky critters with attitude, each one ever at the ready with a "Oooo, that's gotta hurt!" or "Oh no he dih-int!!" After all, cliches and untraceable worn out catch phrases are always in season on the personality farm! 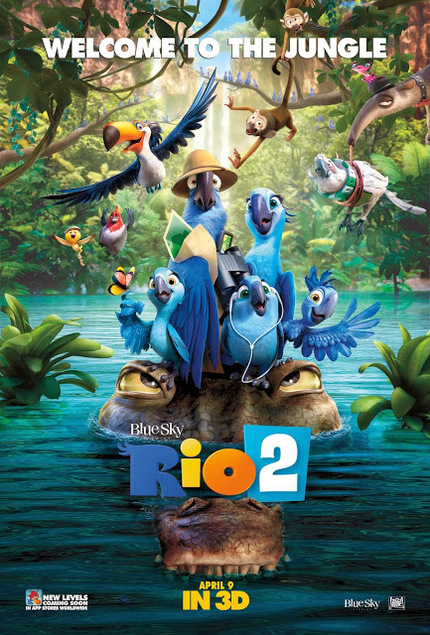 All of these characters, including their human caretakers (voiced by Leslie Mann and Rodrigo Santoro) are whisked away to the deepest recesses of the Amazon rainforest, thus negating the point of the name "Rio", and replacing the popping photo-realistic Rio De Janeiro of the first film with lots and lots of bland jungle scenery. To the shock and dismay of everyone but the audience, a massive flock of blue macaws have been secretly living there in undisturbed peace. Jewel's rigid, human-hating father (Andy Garcia) runs the show, and seems less than thrilled with his long-lost daughter's choice of fanny pack-wearing/GPS using domesticated spouse. And apparently at this point, being a liberated wild bird at heart, so is she. Somewhere in this straining relational drama there might've been an interesting and even engaging family film. But with only beaks to speak of (and speak with), even lip service of such a notion is all but impossible here. This time out, anything that might've bore actual resonance is a creative sham. The story is uneven, the music is not as good, and anyone who's seen a movie before knows what's going to happen before it does. Every moment of Rio 2 is punctuated with a burp, a splat, or a pained re-action shot. Instead of this rainforest being the multiculturally radiant and vibrant utopia that must be saved from the token evil land developers and loggers (their monstrous oversized chainsaw blades protruding in 3D), it's an unintentionally bland and tiring mishmash of blah. To paraphrase The Incredibles, when everyone is the attention-hogging witty quipping class clown, no one is. Kids laugh at this tripe because they've yet to learn the difference between a cheap gag and a decent one. The primary purposes of the low-aiming films listed above are to A) exploit and perpetuate that ignorance for as long as they can get away with it, and B) to exploit the exhausted parental populace who are increasingly unmotivated to discern the quality from the shlock when it comes to entertaining their children. It's a real shame that Blue Sky has opted to torpedo any Pixar-challenging credibility it gathered in the light of the first Rio, a film that at the time I called "immensely enjoyable". Rio 2 has all the markings of a rush job, a studio-mandated follow-up that the contractually obligated creative talent has zero interest in, and the general public could take or leave. If you want to see blue computer animated 3D characters save their forest from heartless capitalists, watch Avatar. Not even Ernest could save this recycled mess.